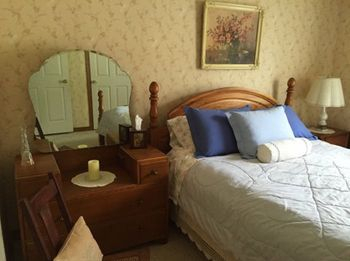 The Inn’s largest room offers queen and king-sized beds and several sitting areas. 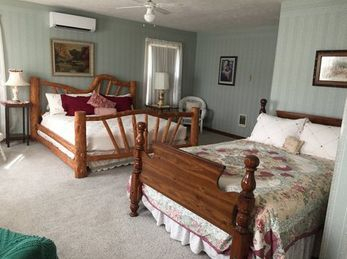 The Aerie is the perfect room for a small family or group of friends traveling together who wish to share accommodations. The Aerie offers a private bathroom with shower. The room is artfully decorated in period antiques accentuated with a few modern pieces, including the large king-sized bed which was custom made by a local artisan. The Aerie room offers a beautiful lake view. The Blue Heron room features elegant earth tones and has a beautiful lake view you can enjoy while resting on your king-sized bed. The room offers a private bathroom with shower. Suitably decorated in antiques, the Blue Heron is the perfect get away for anyone worn out from a day of enjoying all the area has to offer. This is a peacefully elegant room. The Dove is decorated in soft colors, while warm light wood furniture accents the lovely decor. 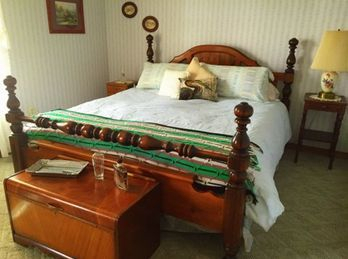 The room offers a queen-sized bed and is quietly located in the rear of the house, with a view overlooking the flower and vegetable garden. The Dove offers a private bathroom with shower. Furnished with a custom-made queen-sized poster canopy bed, the Hummingbird, like its namesake, provides a grand experience despite its small size. 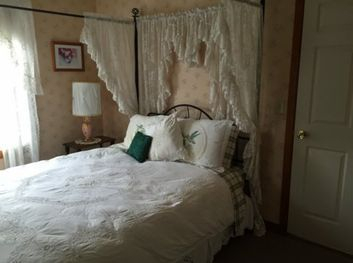 Lovely lace curtains adorn the windows and vintage furniture makes for a splendidly quaint stay. The Hummingbird offers a private bathroom with shower and fluffy linens. This room is best described as the epitome of romance. The classic French country room has a spectacular view of the lake and shoreline. The Meadowlark comes furnished with rosy linens and luxurious towels, and is adorned with beautiful antiques.. The room offers a private bathroom with shower.